The Jurányi Incubator House brings together dozens of theatre groups, associations and creative companies in a former school building owned by the Budapest Municipality. The Incubator House opened in 2012 after FÜGE, the association running the Incubator House, renovated the building and turned it into a complex of affordable theatre stages, rehearsal rooms, offices, galleries and a cafeteria. Jurányi did not only create an unprecedented venue and umbrella organisation for the independent theatre scene, it also brought a cultural and community centre in an area with no cultural activities before. Since its opening, Jurányi’s 5 floors are fully booked, with a long waiting list; it demonstrates the great need for the spaces and services the organisation provides. How did you begin working with Füge? 2010 brought huge changes to the independent theatre scene, when the new Theatre (Performing Arts) Act came into effect. This act is an attempt at regulating the financing structure, operation, state subsidies and employment structures of all performance venues, from stone theatres to creative workshops that no longer operate informally. As a result, a managerial circle was quickly established within the independent theatre scene, which was unprecedented. Creative groups used to form around certain artists, but these individuals and workshops could not handle the overwhelming burden of bureaucratic paperwork necessary to even stay alive and be eligible for state subsidies – without which it is extremely difficult to have performances. At my urging, we came together with other managers to found an umbrella organisation with the goal of providing a management background for the numerous independent creative groups, so that they can focus on art, and we can help them deal with the red tape and apply for grants. The other goal was to give this organisation a production role as well, so that we can also support certain artists if they cannot apply for grants themselves, so we would be able as a production organisation to help them create larger projects, apply for grants or find other resources. Thus we founded FÜGE (Függetlenül Egymással – Independently Together), operating as a public benefit association. It was immediately clear that there was great demand for such an organisation. How did this turn into a need for your own space? A couple of years passed, and I saw that it would be very beneficial to find a roof for this operation because there were tons of things created in the field of independent performance arts, but the infrastructure was insufficient. There were not enough available performance and rehearsal spaces. There were more and more performances, and rehearsal slots became scarce at certain venues such as Trafó, and we did not feel as confident about our performances. It occurred to us then that we should establish a production house type of background where everybody has their own rehearsal space and office, with a large shared storage space, potentially a workshop where we can work on stage sets, maybe a space where we can iron or just store costumes and share them among ourselves. We wanted to establish a base, a home for contemporary performing arts, similar to an office or tenement building. How did you start looking for the right building? Over the following couple of years, I kept thinking about this and preparing business models to see how such a basis could function. Afterwards, I began searching for a property. I knew that a school building would be ideal. A good example for this is Tűzraktér, which was located in Hegedű utca long before our time. They also took a school building and used it for cultural activities. It was evident there that the gymnasium is an ideal option for a performance space, that the school cafeteria can be used as a café, that classrooms are ideally sized to serve as rehearsal spaces. The only shortcoming of a school building is that there are a lot of spaces that are community areas, and not individual units that we could sublet to anybody. So I was sure I wanted to find a school building, and unfortunately there are many unused schools in Budapest. We also wanted to be in Buda, but in a rather central location, because we already knew we wanted it to include a performance space, or at least a place where we can host our audiences, thus it would have been disadvantageous to move to the outskirts. In my experience it is hard to get people to go further outside of the city centre. This narrowed down our list, we looked in districts I, II and XII. 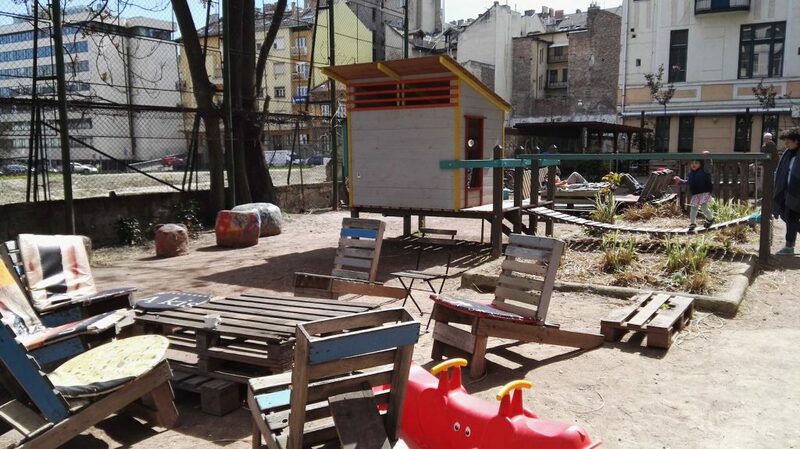 I asked the Municipality of Budapest to give me a list of available properties they would like to repurpose. Eventually, we excluded several buildings due to their state, size and location, and selected the school building in Jurányi utca. This is an incredibly large building. We wanted a 1500 square metre building where 10-12 groups can have relatively large spaces and we would still have room for communal areas, but this is a 6700 square metre building. Two schools used to function in this building, but it had been vacant since 2009. It was in a relatively good state, a portion of its windows were renovated a few years before the schools closed down. The heaters were still in place, which was lucky as we had seen several places in much worse states of disrepair. The size of the building scared me at first, but we had no other option, and the building itself is very charming. Then we created the current operational model, which goes beyond the modern contemporary performing arts function. We invited other NGOs and creative artists as well, everybody who could somehow be connected to our operations and this progressive, innovative contemporary art function. And then we began communications with the Municipality of Budapest. I tried to approach them by showing them why this would be beneficial to the Municipality. I calculated that they are spending between 500,000 and 1,000,000 Forints monthly just to have a doorman, to operate the elevators and have the chimneys swept. There were numerous negotiations about the state of the building, our options, our vision about the operation. 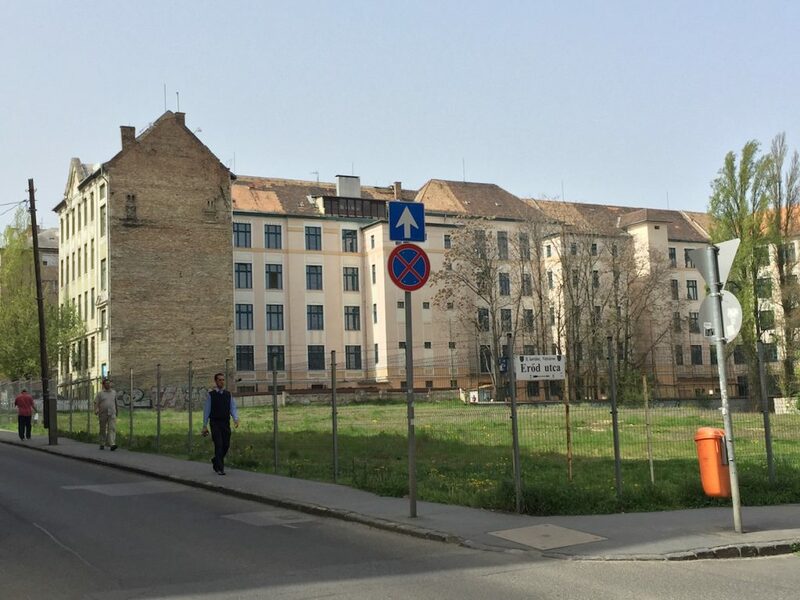 In the end we got to the point where we could submit an application, because there are tons of vacant properties on the BFVK (Budapest Property Management Ltd.) website, and if somebody makes an offer on one, they issue a call for applications. Eventually they told us our application was successful and we could use it all… I mean the three floors we wanted. In the meantime I was constantly bringing artists and ensembles there, I had six to eight “building tours” every day. By the time we received the stamped and signed agreement for the three floors, we had tenants for the whole building. We received the keys in early July of 2012, the day before our wedding, and we immediately began renovations. This was a Friday, and the following Monday the groups I had signed contracts with were already there. We opened our gates in late October, by then we had completely renovated the whole building of over 6,000 square metres: we laid down a parquet floor, we painted, and we arranged running water, heating. The plumbing was also very worn-down. We undertook the renovations for the whole building, therefore we received a little discount from the price and we did not have to pay rent until we actually started to operate. How did you organise the renovation works? We spoke with three companies at the beginning, all three were related to somebody from us, and we eventually selected the best price quote and the most reliable team. This was a team from Székesfehérvár who commuted daily, but they still worked cheaper than any of the offers from Budapest. We did an initial calculation of our budget for this, we had to strictly keep it, there was absolutely no room for going over the budget or the timeline. The renovation cost approximately 50 million Forints gross. How did you get the money together? We had some savings as we already received subsidies from companies (deductible from their corporate tax) after our ticket sales. We also tried to find grants for renovations; at the time we had won an operative subsidy from the OSI. MasterCard had already been our main sponsor for three years, and we asked them to focus their support on this complex, on this headquarters instead of our productions. We could also use a proportional part of the subsidies from the municipality for the renovation. We also took out loans from companies with very reasonable interests; we were able to pay back all of these loans within a year. In addition, we had a private Maecenas as well who did not give specific donations but served as an assurance that enabled me to start all this. This person said that if there were any problem, he would be there to help. At one point a much-awaited subsidy did not arrive on time, and I called him to say “I have to pay the team the next day but I have no money on my account.” He immediately wired us the money, which was practically an interest-free loan. This was the assurance. We have paid everything back to him, but at the time it felt great to be able to rely on him, and to this day he is standing behind us like a rock. Do you think this model can be reproduced elsewhere? I definitely think it can be reproduced, and I also see that there is still a great demand that we cannot satisfy. Since December 2012, we have accumulated a waiting list of several hundred groups. Some may have given up since then, and are probably not waiting for our response with their bags packed. But there is a constant flow of applications, and not just from performing artists but also filmmakers, independent artists, painters, and creative minds from a relatively wide spectrum. This is due to the fact that the incubator house’s message is very positive and draws people in. If somebody started a similar, quality initiative, it would certainly be filled up within seconds, before the ink could dry on their contract. But I can also see that this is crazy work. Over the one-year period when we were searching for potential projects, my experience was that there are ideas but only a few organisations and individuals have the courage to really commit to realising these ideas. Without such commitment, it is very difficult to do anything, and it cannot be imposed from higher levels. Did the building itself determine what projects could work here and what could not? It did because we did not want to break down walls unless we had to, but we still did in several places. 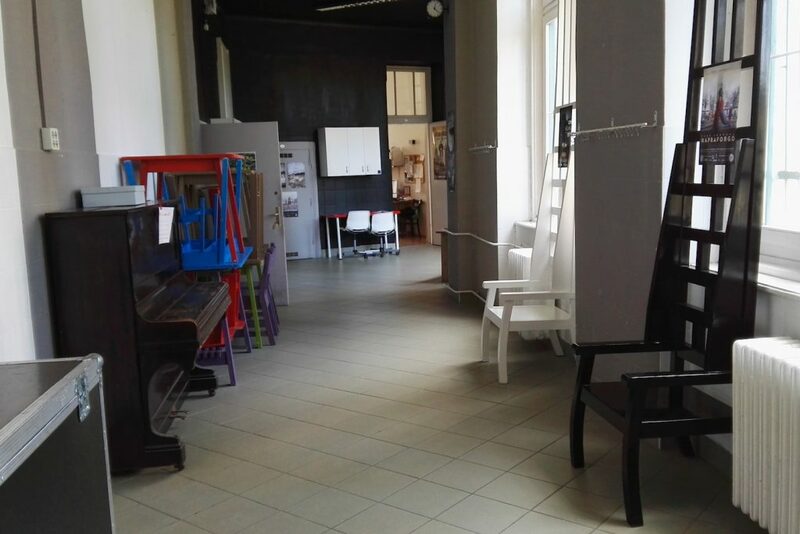 On one of the floors, we actually took down the walls separating the corridor from the classrooms: it was for a team of architects who had quite specific ideas about their operations, and this corridor became a large living area. It is used by just a handful of organisations, but sometimes we also organise meetings there. Other than this, we mostly adjusted the functions to the characteristics of the space. Initially, we had several ideas such as creating communal kitchens in certain rooms on every floor. But the demand for studios became so great that we gradually gave up on these ideas. The individual triumphed over the community. But we realised that the corridors are quite wide, so we set up kitchen boxes there, which demonstrate that there is always a solution. We initially adjusted everything to the space, but then we adapted the space to our needs. The school has a pretty good layout. I saw from the beginning that it has the advantage of being very two-faceted: if you enter the building and descend the stairs, you will find a large community space, a big cultural complex with a café, a ticket booth, a theatre, a courtyard, a terrace. But if you go up the stairs, you will find an apartment building, and only those who have business there go up. This was also important in terms of security, there is actually a metallic door that separates the people working there and renting studios from the civilian audience. How did you determine rents and what comprises your budget? 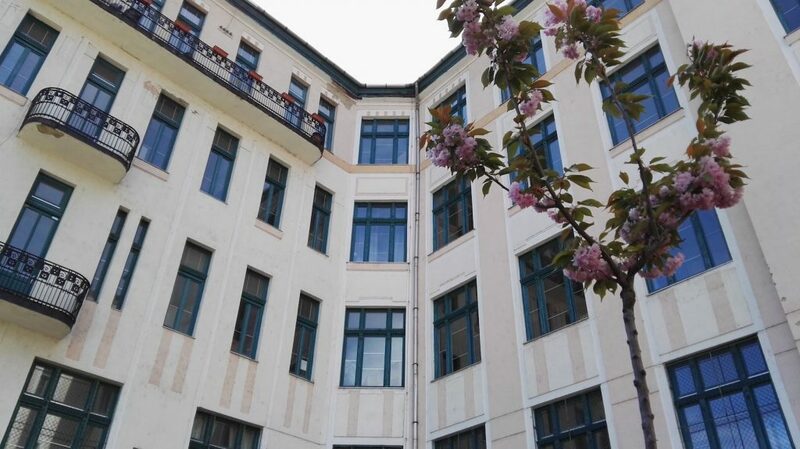 I made a preliminary assessment of expenses: I prepared a calculation to see what utility costs can be expected in a building of this size, I asked for figures from similar, still operating schools as well as theatres and other facilities, I calculated the costs of the doorman service, the daily cleaning. And we had to pay rent, by then I knew that we would only have to pay 30% of the total rent with the municipal subsidies. I added all these expenses and divided the result by the area of useful rentable space, thus all spaces gained a price tag. Another important aspect is that the rent varies according to function. 80% of our expenses are utility bills, therefore it was important to me that somebody renting a storage space and only turning the lights on once a week for moving furniture should pay less than somebody renting a rehearsal space where they regularly use theatre lights. We established three rental categories: storage spaces for 1000 Forints, offices for 1200 Forints and rehearsal spaces for 1500 Forints. This includes all utility and internet costs. This is a quite favourable price per square metres. It was important to us that the incubator house should break even, meaning that the costs of cleaning, infrastructure and rental expenses should be balanced out by the rent received from subletters. This was the basis of our business model. We could not afford to support this organisational model, to be sponsors, so we do not put extra money into the project, but we also do not generate profits from it. So the amount we have to pay is the minimum we have to receive. This way, we managed to break even, and we can still keep it like that, while obviously we have to raise rents if the Municipality of Budapest does. Our rental prices are stable, in the three years since we opened we only increased the prices per square metre by 5%. In addition to this, we also serve as a production house and community space organizing approximately 30 programs for the public per month, which is a considerable amount. It is important for us to have revenues from these programs that we can reinvest into renovations and other expenses: for example, if we want to display posters on the corridors we can afford to buy poster holders. We receive a certain percentage of the ticket revenues of performances held here, but we also have a crew of 12 people, so we have significant personnel and tax expenses, which we finance by applying for funds from operative programs. 10% of our total revenues come from such state subsidies, while our infrastructural expenses amount to 6-7 million Forints per months. If we add everything up that is a little less than our total operational costs, about 40% of our revenues. How do you imagine Jurányi in three or five years? We are actually close to reaching a milestone now because our contract is for 5+5 years, and we have been operating for three years. This autumn, we will have to confirm whether we want to use the additional five years. Obviously, nobody invests fifty million Forints into a building if they feel like they do not have a written contract and they can be evicted at any moment. I have seen bad examples around me in terms of cultural venues and local governments. I felt that we should rather pay more money rather than be subject to eviction on a whim. In this sense, I do not think it is a disadvantage that we are not owners, although in my opinion many tasks, such as maintenance, should be the responsibility of the owners. The big issue is always what we want to achieve next and what the next development should be. Anybody running such an institution knows that the big plan is being able to carry on: it is more than enough if we can continue our work and maintain this level, even under worse conditions. Of course there are always smaller projects. We would like to develop international communications: we are continuously seeking infrastructures and institutional models that are similar, with whom we could create joint projects, find out what we could do that would benefit both or several organisations or even the creative artists or workshops. We also work on enhancing the community function: both within the house, among the many organisations; and with the public, to show civilian spectators that this is a contemporary community space, a new contemporary cultural centre with new contents. In Autumn 2016, Jurányi House decided to prolonged its contract and in October 2017, Jurányi celebrated its 5th anniversary. Budapest, Culture , civic space, co-working, community, culture, design, education, English, Funding the Cooperative City, municipality.